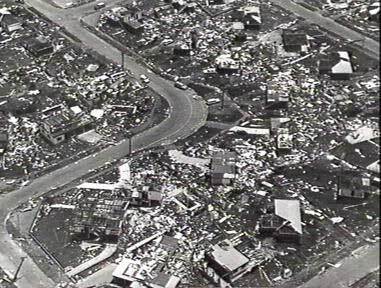 A review of sites showing Cyclone Tracy pictures, information, maps and comments. Personal experience of cyclone destruction and official Government reports build a picture of the massive destruction caused by Tracy. The Australian Government Bureau of Meteorology website has a fairly brief description of the cyclone which devastated Darwin in 1974, including a map displaying the times and route taken by Tracy. As you can see, it is not a detailed map but gives a good idea of how events unfolded. A good selection of black and white photos taken by Alan Dwyer of the damage caused by Tracy is available at the National Library of Australia with copies available at $A35-$A45 per image. 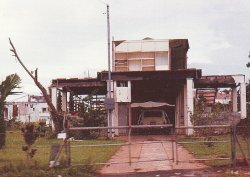 (left) This image of a sheet of galvanized iron wrapped around a tree branch appears in a 2004 anniversary article on Cyclone Tracy published by the ABC. More news coverage is blended into the 1986 Cyclone Tracy Movie. I arrived in Darwin in 1978 and can remember clearly a similar sheet of iron high in a tree in Lee Point Ave. It was there for quite a while and we often used to look for it when the family drove that way. Darwin has changed considerably since then and as the ABC article says, "Those who remember what the place was like before Christmas 1974 have mixed feelings about the changes". Kevin Mulcahy has an interesting collection of pictures from early 1975 which give some idea of how long it took to rebuild the city. As this photo shows, people used whatever shelter they could while the rebuilding was done. In fact the rebuilding has hardly faltered for the past 33 years, resulting in a city nearly three times the size of the one flattened so many years ago. and take a stroll through the Darwin Central Cemetery where many of the victims of the cyclone are buried. To read more about Tracy, and even add your own experience if you were in Darwin around the time Tracy hit, click here. 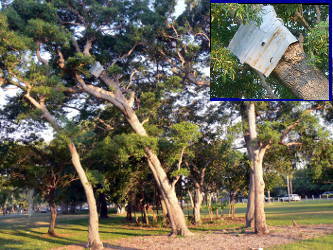 Darwin was paid a brief visit by Cyclone Helen in January 2008, fortunately only resulting in minor cyclone damage.